Your personal confession broadcasts your real character and sets the course of your life. (See James 3:6) Watch what you allow to come out of your own mouth. Choose to decree what God says in His Word. Be careful not to judge others…because there is always something you don’t know in every situation. Speak God’s Word and stay in alignment with Him! Print this off or save it, and choose to pray it daily out of your own mouth. Watch God move on your behalf. Jesus is Lord over my spirit, my soul, and my body. (Phil. 2:9-11). Jesus has been made unto me wisdom, righteousness, sanctification, and redemption. I can do all things through Christ Who strengthens me. (1 Corinthians 1:30, Phil. 4:13). The Lord is my shepherd, I do not want. My God supplies all my need according to His riches in glory in Christ Jesus. (Psalm 23; Phil. 4:19). I am the Body of Christ. I am redeemed from the curse, because Jesus bore my sicknesses and carried my diseases in His own body. By His stripes I am healed. I forbid any sickness or disease to operate in my body. Every organ, every tissue of my body functions in the perfection in which God created it to function. I honor God and bring glory to Him in my body. (Gal. 3:13; Matt. 8:17; 1 Peter 2;24, 1 Cor. 6:20). I have the mind of Christ and hold the thoughts, feelings, and purposes of His heart. (1 Corinthians. 2:16). I am a believer and not a doubter. I hold fast to my confession of faith. I decide to walk by faith and practice faith. My faith comes from hearing and hearing by the Word of God. Jesus is the author and the developer of my faith. (Hebrews 4:14; Hebrews 11:6; Rom. 10:17; Hebrews 12:2). The love of God has been shed abroad in my heart by the Holy Spirit and His love abides in me richly. I keep myself in the Kingdom of light, in love, in the Word, and the wicked one touches me NOT. (Rom. 5:5, 1 John 4:16, 1 John 5:18). I fear NOT for God has given me a spirit of power, of love, and of a sound mind. God is on my side. (2 Tim. 1:7; Rom. 8:31). I hear the voice of the Good Shepherd. I hear my Father’s voice, and the voice of a stranger I will not follow. I roll my works upon the Lord. I commit and trust them wholly to Him. He will cause my thoughts to become agreeable to His will, and so shall my plans be established and succeed. (John 10:27; Proverbs 16:3). I am a world overcomer because I am born of God. I represent the Father and Jesus well. I am a useful member in the Body of Christ. I am His workmanship recreated in Christ Jesus. My Father God is all the while effectually at work in me both to will and do His good pleasure. (1 John 5:4,5; Eph. 2:10; Phil. 2:13). I let the Word dwell in me richly. He Who began a good work in me will continue until the day of Christ. (Col. 3:16; Phil. 1:6). I thank God He is frustrating all evil plots and ungodly counsel in every area of my life, and over the nation. He goes before me to make every crooked place straight. 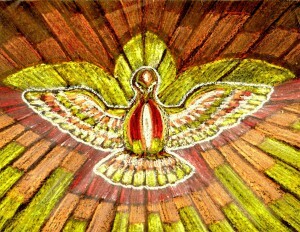 The Holy Spirit reveals all hidden truth and shows me things to come. 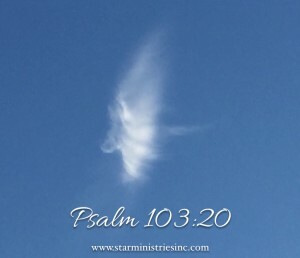 Psalm 103:20 reveals that angels obey the voice of God. Pray His Word and expect intervention. A LEAP OF FAITH (25 Days At The Mercy Seat)…the full account of the miracles at Mercy. God raised my husband from death, healed him from two strokes, and the walk with us through two open-heart surgeries. This book will inspire you to take your own leap of faith. THE MIDNIGHT HOUR (Will America Turn Back To God? )..a must read for every leader. God has the most amazing ways to touch the heart of just one person. And He goes to extreme measures to do so. I don’t know what you are walking through right now, but God does. Be assured that He is at work behind the scenes to make all things right. He loves you with an everlasting love and has greater things than you can imagine for Him to do through you as you cooperate with Him. “Exercise foresight and be on the watch to look [after one another], to see that no one falls back from and fails to secure God’s grace (His unmerited favor and spiritual blessing), in order that no root of resentment (rancor, bitterness, or hatred) shoots forth and causes trouble and bitter torment, and the many become contaminated and defiled by it” (Hebrews 12:15 Amplified). The person who is bitter over something from the past can get mad at the slightest little thing—like something springs up out of their heart. It can be a wrong glance, a misread text, a bad report, or something they even assume to be factual that is not so. People can become crippled emotionally and defeated—spending all their time battling emotional problems. No matter what the circumstance, you must choose to forgive all who have trespassed against you. This frees you and opens the door for God to vindicate you. You can hear the Voice of God when you walk in freedom as well. He can use you to encourage others, while all along it is great encouragement to see the Lord at work in your own life. Let your first thought be, “Lives are at stake” and reach out to touch someone. God has the most amazing and unique ways to reveal what is going on behind the scenes to encourage one person. Always listen to the Holy Spirit and follow Him as He leads. This past week we had to have a cedar tree cut down—as it was growing strong and roots could damage the underneath of structures. 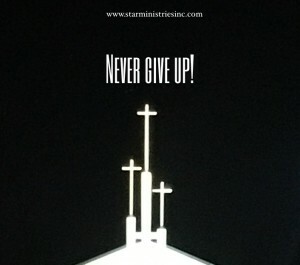 I won’t share all the details…but God went to extreme measures for one man that needed encouragement. Later in the day, as I was taking my dog (Beau) for a walk, there was a large truck in the middle of the street grinding up the pine tree that we had taken down—with dust flying all over the place. I thought to myself, “Oh my goodness—that looks like lung cancer”…..as the workers’ trucks were covered and appeared brown at this point. I didn’t understand why the truck didn’t move forward away from cars, but perhaps they didn’t see them. Who knows. At the time, I didn’t realize what the Lord was doing—but He did. The last storm that came through this area took one of our shudders off our home from the strong winds and we had asked J.R. to put it back up. He has a great lawn and maintenance service and we’ve known him for many years. When J.R. went to secure the shudder, he realized his ladder wasn’t long enough and walked across the street to ask workers at another home if they could help him or let him borrow their ladder for about ten minutes. The next day, one of the workers came over to ask about my husband’s request of putting up new shudders and doing some extra work. As we were talking, the owner walked over and said he would talk with me. He began coughing and I knew in my spirit (by the Holy Spirit) that he had lung cancer and the Spirit showed me why He allowed me to see the dust. I began to share the story of the tree and the dust and then Fred opened up and told me he was just diagnosed with lung cancer. He shared his heart about how his parents died with lung cancer and how he had lost his wife several years ago (also to cancer) when his two boys were younger. He had prayed and asked the Lord to please allow him to live till the boys were grown. I asked Fred if I could pray with him and asked if he was saved. God opened the door to allow me the opportunity to pray for this precious man. I prayed with him on the spot and we connected on facebook. I told him he would enjoy reading the encouraging posts. God did all of that to show Fred that HE saw and knew he had lung cancer—and GOD showed a total stranger. It was all the work of the precious Holy Spirit. He is amazing. Fred told J.R. about how God moved the next day. He told him that God told the lady across the street about his cancer. J.R. called me today to share this with me. I stand in awe of how our loving Heavenly Father works. Now, take a minute and think about this—if the storm had not blown up, the shudder would not have fallen off the house. If the cedar tree had not kept growing through the seasons of wind, rain, and sun, with potential of causing a problem, we would not have had to take it down. The dust would not have blown all over the place from the truck that ground it up and made it go all over the vehicles in the street. The wind was blowing in every situation—and what appeared as problems were actually a setup to connect people and bring encouragement. Choose to view problems as opportunities to connect with new people. It is the way God works. He loves all people. He loves you. Look for and expect opportunities to encourage people. You may be the very one God uses to silence the critic in someone’s life and to inspire them to keep moving forward. You never know what people are walking though until you get close enough to care. Be an extension of the heart of God today. God has greater things planned for His Sons and Daughters than any of us can imagine. He promises to vindicate and protect us in His Word. There is healing in the name of Jesus. Sickness and disease have to bow at the Name of Jesus. Thank God the HOLY SPIRIT guides us—and He always does it according to the Scriptures. He reveals ALL hidden truth and shows us things to come…what an amazing LOVE HE has for us and HE sings over us…. be a blessing to all you meet. I have permission from Fred Gilfillan to share this story—and it will be in my new book as well. Please join me in praying for Fred for healing from cancer—in Jesus’ name. Pray for your family, friends, and enemies. Pray for the President of the United States- President Donald Trump and his family, staff, and all those connected to him in every capacity. Pray for the military and all other organizations from police to firemen and women. We are instructed by God to pray for those in authority over us—and to obey, as long as it does not go against God’s Word, or they command us to do things that God forbids. Never give up, lives are a stake. Keep your heart clear and free so you can hear the Father’s Voice at the slightest whisper at the door of your heart—and obey! Remember, there is always room for one more at the Cross of Jesus Christ. He is our healer and Redeemer! GOD’S PRICELESS TREASURE (How To Overcome Challenges, Be Transformed And Know Your Purpose)….learn how to move from drama to destiny, pain to purpose, a mess to a message. There is life after separation, divorce, cancer, abuse, abandonment—there is life in turning to Jesus. A LEAP OF FAITH (25 Days At The Mercy Seat)…..the full account of God raising my husband from death, two open-heart surgeries….this book will teach you to overcome in any area. THE MIDNIGHT HOUR (Will America Turn Back To God?) …a must read for every leader.